Like crispy edges on your lasgana? Hate messing with those cooked noodles? Then this pan is for you. 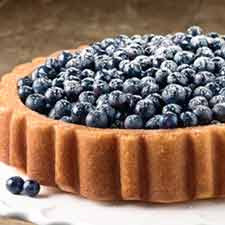 The Baker’s Edge company has a hot, new, savory product that will soon hit the store shelves. That’s right lasagna lovers, it’s YOUR turn! 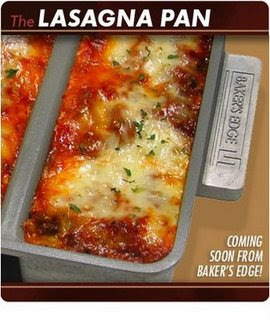 Baker’s Edge has a new Lasagna pan! 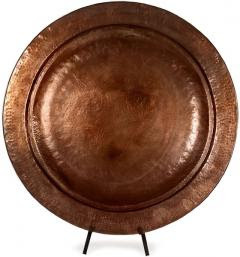 I don’t do formal meals often, but would love a set of copper chargers for those times I do. It’s been many years since we bought flatware and we really could use a new set. 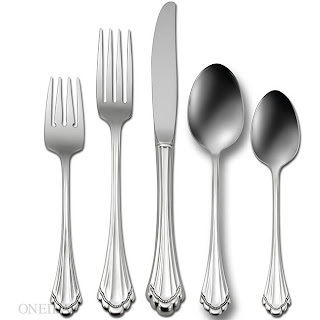 I love this set of Oneida I found over at overstock.com. It’s been awhile since I’ve done a Kitchen Wishes post, but as I progress through this temporary situation I find I am missing more and more of my “own” things. 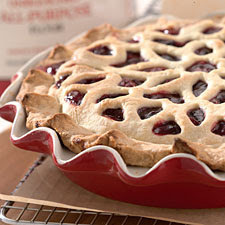 So today with the help of King Arthur Flour I’m doing a little dreaming again. 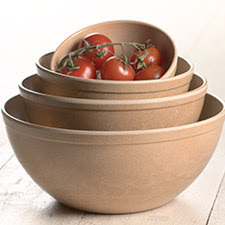 Like for these Wisconsin Mixing Bowls – they are so versatile, durable and just plain useful. 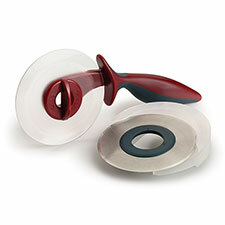 And for this dual bladed pizza cutter – I use a pizza cutter to cut way more things than just pizza. 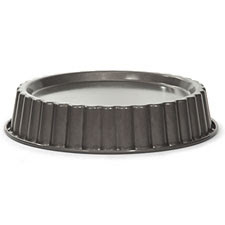 They work wonders on quesadillas and even better on scones. 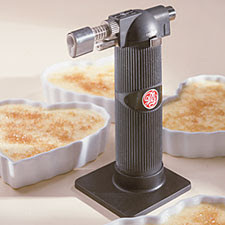 And I really miss the specialty tools like a chef’s torch or the simple things like a flour wand. I’ve been thinking about this category for several days and no matter how you look at it, it is subjective. I mean if I cooked a lot of oriental food I’m sure I’d find a WOK an essential tool, but I don’t so we’ll approach this the same as we did the pantry, we’ll try to apply logic and I’ll list ‘my’ essentials and then you can interpret any way necessary for your household and the meals you prepare. As for essential tools I have many that I consider truly essential! But, in reality we can truly get by with very few. I consider a good set of cutting boards, a set of great sharp knives, my cast iron skillet, quality stainless steel pans, spoons, spatulas and tongs a necessity. I try to stay away from most plastics as they do wear quicker and tend to harbor bacteria. I’m still using the same stainless steel tools and cookie sheets I spent a small fortune on 20 years ago, so that expenditure has paid off. The cast iron skillet has been passed down through my hubby’s parents and grandparents and it too is still going strong. I did purchase new heavy gauge stainless steel pots and pans about 10 years ago and they look brand new as stainless cleans so well. I also stay away from all non-stick surfaces as they do wear eventually and I just don’t want that in our food. I do change my cutting boards and rubber spatulas every couple of years just to be on the safe side despite always running them through the dishwasher. As much as I like all my pampered chef toys, they could all be eliminated by using just what I have listed above. Personally I cannot live without my essential Kitchen Aid stand mixer & hand mixer and my Cuisinart mini food chopper. I have a blender, but only use it to make my home made Creamy Tomato Basil soup. I don’t even own an electric can opener. I do love my slow cooker too and my Magnalite stock pots and roaster, but they too could be substituted with other pots and pans. Now for seasonings, this too is subjective based on the foods you prepare, but honestly if that recipe you cut out of a magazine calls for Herbs de Provence don’t run out and buy it for a one time recipe. It is a combination of herbs you probably already have on hand. It usually contains rosemary, marjoram, basil, bay leaf and thyme. So you can adjust what you have with your own likes. What I consider essential in the spice cabinet around here is kosher salt, sea salt, white & black pepper, celery salt, garlic salt/powder, basil, thyme, oregano, marjoram, parsley, paprika, cinnamon, apple pie spice, pumpkin pie spice, PURE vanilla, maple sugar, orange rind, bourbon extract, rum extract and vanilla powder. In the pantry I have flour, bread and cake flour, self rising flour, sugar, brown sugar, powdered sugar, coconut, golden raisins, cornstarch, baking soda and baking powder, rice, barley, split peas, tapioca, white rice, brown rice and various pastas. In the way of liquid essentials I have Worcestershire sauce, soy sauce, honey, apple cider vinegar, red wine vinegar, champagne vinegar, olive oil, canola oil, balsamic vinegar and several flavored rice wine vinegars. In the refrigerator I have mayonnaise, ketchup (both homemade when I have the time), mustard (despite my severe life or death allergy everyone else LOVES it), sun dried tomato pesto, Better than Bouillon chicken and beef bases, fresh lemons & limes and chili sauce on a regular basis. The real key here is to have what YOU need on hand at all times without a lot of effort. 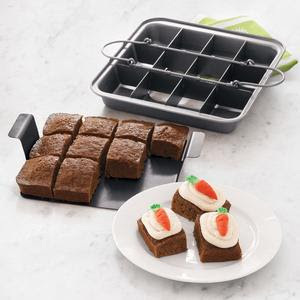 I can see that Slice Solutions brownie pan has soooooooooooooooooo many possibilities. I love Sur la Table! 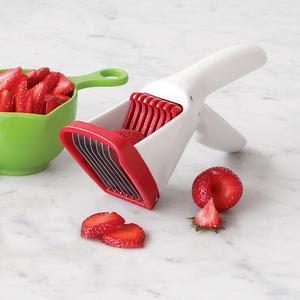 This strawberry slicer is totally decadent, but would be great in the summer especially. 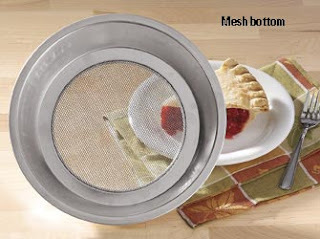 I love this stainless steel mesh pie bottom to prevent soggy crusts and the “additional” measuring spoons that this set offers from The Home Market place. You can never have too many measuring spoons. I love to dream and wish. This also creates a great list for family and friends for gift ideas. Want to play along? 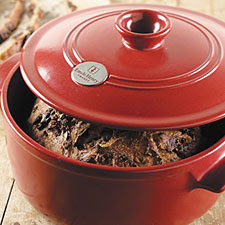 These great items from Williams Sonoma and Villaware are on my covet list this week. From top to bottom: angled potato ricer, hand crank pasta machine, brushed stainless steel soup/stock pot, avocado pitter & slicer and Cuisinart Popcorn popper. Of course I can live without all of them, but would really rather not some day! 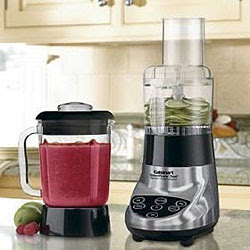 I love this Cuisinart combination food processor and blender from Overstock.com. 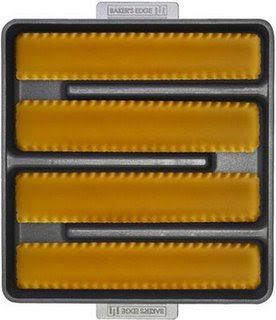 Cooking Enthusiast has some fun items. This stainless steel extra large scoop and mesh flavor infuser would both be so helpful. 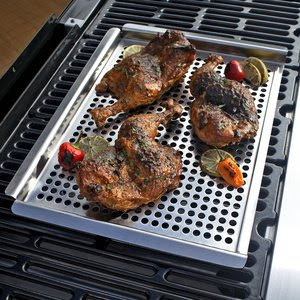 With the summer season upon us I want to be grilling more, but also grilling healthy so this stainless steel grid for the grill form Sur la Table would be sooooooooooooo helpful. Williams Sonoma is also one of my most favorite cooking stores. 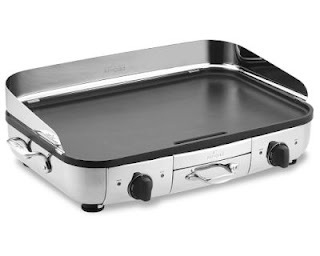 I found this electric griddle over there and I really need a new one. Mine is a hand me down from my grandmother that has been on its last legs for years! 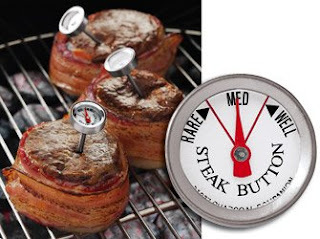 With grilling season upon us, this steak thermometer would be pretty awesome from Home Market Place. 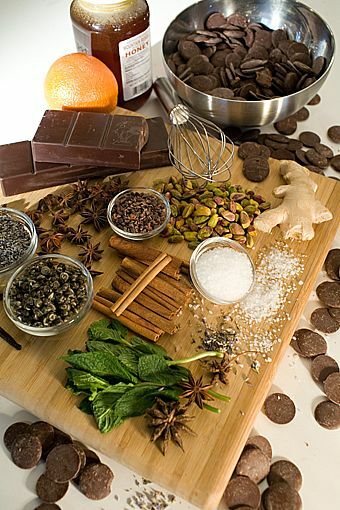 Williams Sonoma is one of my favorite dream places! 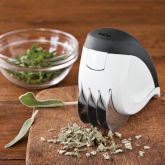 I’d probably use more FRESH herbs if I had this mincer. Another of my favorite places to dream is King Arthur flour. 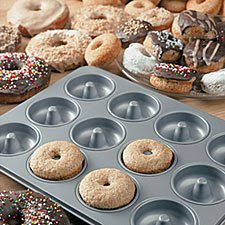 I’d really like a bread baker and this doughnut pan. 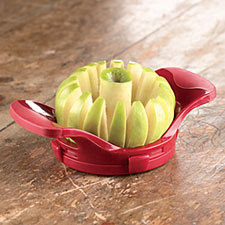 The extra blades in the apple slicer will be awesome for those thinner pieces. 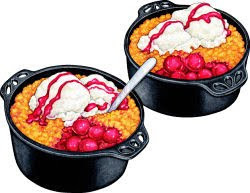 These individual cast iron cobbler pans from Gooseberry Patch will make good use of those thin slices also. Here are a few more tools I’d like to have at hand. Amazon’s book description: She’s taught us every facet of Italian cooking–from traditional and regional to seasonal and contemporary. She even made us fall in love with pasta again by opening us up to lighter, healthier versions that don’t weigh us down. Now the Food Network star and bestselling author of Everyday Pasta, Giada De Laurentiis, takes us down a new path, sharing her love of food with clean, vibrant, simple flavors and bursts of bright colors that look as beautiful on the plate as they are delicious. Yes, you will still find those fabulous recipes she remembers so fondly from family meals, but you’ll also find updated twists on classic trattoria favorites–California-inflected, hearty but not overwhelming, and with the perfect balance of healthfulness and terrific flavor. Wouldn’t you love a faster, lighter take on osso buco (here made with turkey instead of veal), a salad with real substance (like one of cantaloupe, red onion, and walnuts), and fish that gets an Italian makeover by way of lots of fresh veggies and accents such as fennel and grapefruit salsa? And let’s not forget dessert. After all, what’s not to adore about little doughnuts dipped in chocolate sauce? Ranging from soups and snacks to easy entres and elegant dinner-party fare, Giada’s recipes are perfect for any day of the week. And for the first time, she includes a full section of dishes that the little ones will love making as much as they love eating (like mini chicken meatballs). 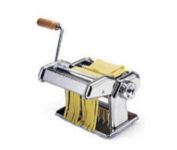 With something to please everyone at your table, Giada’s Kitchen deliciously demonstrates why Giada De Laurentiis has become America’s best-loved Italian cook. Italy meets California in Giada De Laurentiis’s collection of 100 new recipes. 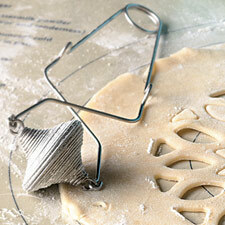 She focuses on fresh ingredients, simple preparation, and bright flavors. Anyone who wants to indulge in the pleasures of Italian food without feeling weighed down will find inspiration for delicious, hearty yet healthy weekday meals. Giada’s recipes satisfy both our desire to eat with gusto and to feel good about what we eat. Amazon’s book description: Slow-roasted meats, marinated vegetables, surprising flavor combinations, this is not your mother’s sandwich. With acclaimed restaurants located across the United States, and a high-profile job as head judge of the hit show Top Chef, Tom Colicchio is one of the best-known chefs and personalities in the culinary world today. His popular chain of ’wichcraft sandwich shops is known for crafting sandwiches with high-quality fresh ingredients prepared to Colicchio’s exacting standards. And since the first ’wichcraft opened in 2003, diners can’t seem to get enough. 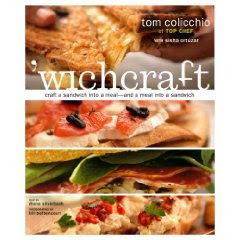 In ’wichcraft, Colicchio shares the shops’ secrets with step-by-step recipes for all their best-loved offerings. Amazon’s product description: Anyone who has visited Carmine’s flagship Times Square restaurant knows that Carmine’s food is the best of classic Italian cuisine—each dish prepared simply to bring out the most vibrant flavor and make anyone who tastes it smile and reach for seconds. 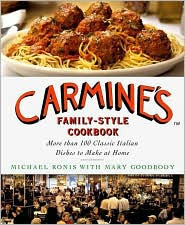 Carmine’s Family-Style Cookbook reveals the simple secret of Carmine’s longtime success—hearty, rich Italian food, just right for sharing, and perfect for cooking at home! Carmine’s restaurant packs them in every night in its four bustling locations, including its warm, festive Times Square flagship where over a million people from all across the country come every year to share meatballs, chicken parmigiana, linguini with clam sauce, and fried calamari. Carmine’s flavors are the tastes Americans love to cook and eat at home—fresh garlic, bubbling tomato sauce, and pasta boiled just to the perfect al dente. Try any of the recipes in Carmine’s Family-Style Cookbook and bring home that classic Italian flavor to your family. excerpt from Amazon’s review: Despite its title, almost every recipe in this book uses meat, fish or eggs. 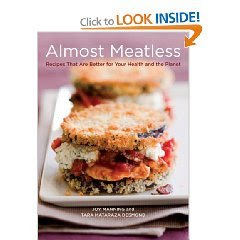 A collaboration between Manning, a former vegan, and Desmond, an unabashed meat lover, the aim is to help Americans, who they believe eat far more meat than is healthy or good for agricultural sustainability, compose meals that are both tasty and filling without having a slab of meat as the overbearing star ingredient. Instead, meat appears in smaller quantities supplemented by layers of flavor in the form of additional savory ingredients that should keep people who usually expect lots of meat from noticing the difference. A while back I began Kitchen Dreams & Wishes at 3 Sides of Crazy and then it gravitated over to my food blog, OUR KraZy kitchen and now that it has grown into a wonderful collaboration of some awesome foodie blog buddies, it only seems natural to move Kitchen Dreams & Wishes to my personal food blog. 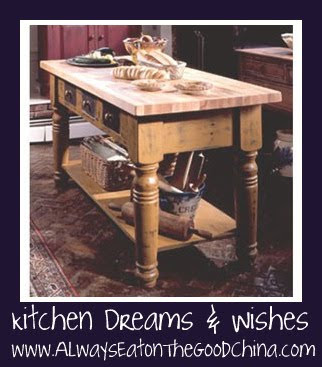 What does this step chest have to do with the kitchen you may ask? Well, I dream of it as a pie safe, jam cabinet & spice cubby! 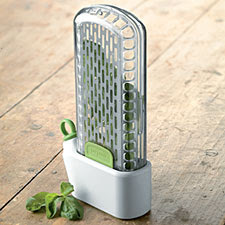 I love this strainer! It seems that all of mine have holes that are just big enough to get the food particles caught and torn! 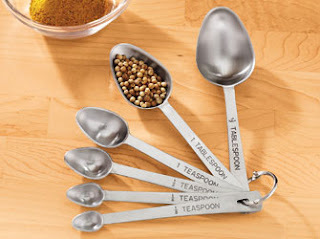 These measuring spoons are wonderful for actually getting into spice jars easily. 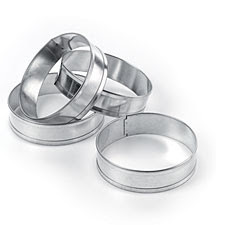 I’m going to be making English muffins soon and these rings will be of a great help! And this is just a great idea! 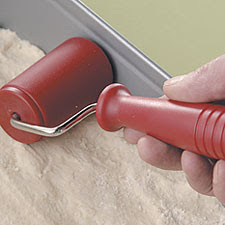 It could be used in the kitchen and EVERYWHERE else!